We released an update earlier today that was mostly about Property Management stuff, but we slipped in a couple things for emailing that will make your life a lot easier. We have a lot of changes coming for guest communication - responding to inquiries, dealing with guest responses, capturing a timeline/thread of everything - but we wanted to fix a problem that has been frustrating users for awhile. You can now quickly switch to a different email template when sending an email. No matter what kind of email you're sending, you can tell the email editor to load in a different template. You'll now see a little "Switch to Template" selector at the top of the email form. If you open the selector, you'll see all system and custom templates that are available for the current record you're on. Upon selecting a different template, the email form will reload with that template loaded. There are a variety of times when you need to email the guest but a specific event or automation point can't take care of it automatically. This ability to switch to, and prefill, a different template means you can take care of other ad hoc issues quickly right from the booking record. No need to copy/paste information back and forth between OwnerRez and your email program for boilerplate issues anymore! As part of this, the other problem was that there was no simple "send email" form where you could just pull up the guest's booking and fire off something. Sending email in the system is always tied to a specific event. We took care of that problem too. 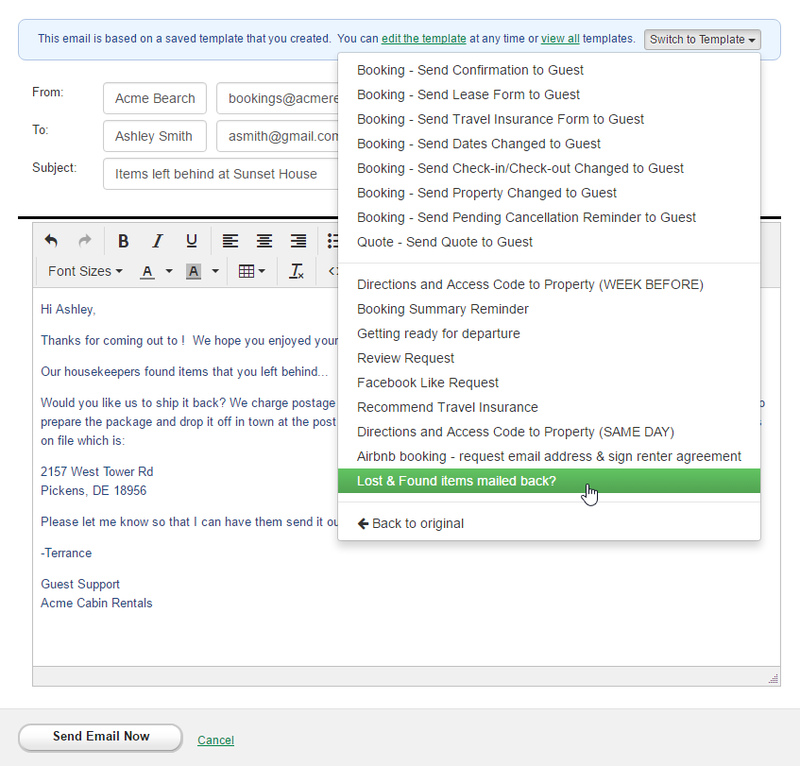 You'll now see buttons on the booking's overview page, yellow header bar and on the booking > email tab for "Email the Guest" which will open an email window where you can send ad hoc messages. Our big conversation overhaul will also take care of these problems, but we wanted to slide in an update for this right now as we continue to work on the big picture items. This is AWESOME! Nice job.